This post is, in part, a response to something I saw on social media. As I did not want to do something I have recently been educated to understand as thread-jacking* or possibly flaming, I elected to discuss the matter here, in my own forum. I welcome discussion and commentary, as long as it remains respectful and appropriate (from anyone but spammers, who have forced me to moderate comments…sorry). The article referenced was posted on a site called lifehacker in their section about health issues, discussed and posted by Melanie Pinola (2014). It was recommended as including one of their “favorite pieces of advice” and summarized the information that was originally posted by Julien Smith (founder and CEO of Breather) on inoveryourhead.net in 2011. I had some mixed feelings about the article. The general premise of the article appears to be self-actualizing disclosure about letting go of societal strictures on conduct and self-esteem to be a happier person. I cannot argue with that. I really cannot. 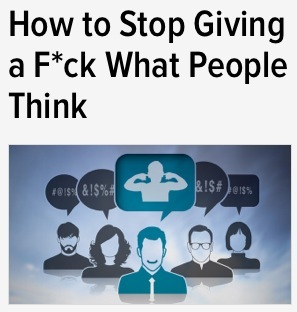 The author goes on to describe five steps that can bring you (the reader) to the Zen-like state of “not giving a f@$%” about what people think. There are some really good points that he makes: Doing things that you think are embarrassing, accepting awkwardness, refusing boundaries, telling the truth, and beginning your new life by trying new things. All of these are some pretty decent suggestions for living a fuller life. I also agree with the author in his observation that assumptions that people are worried about or paying any attention to what you are doing, saying, or anything else are generally irrational and arrogant. It’s true. While we waste our time and precious cognitive energies on worrying about what people are thinking about us, they are usually doing the same thing and couldn’t give a rip about anything outside their own little self-centered bubble of neuroses. People who worry consistently about what people think of them and about them and live their lives to the script written in their own imaginings of what they believe others to want are a bit arrogant. Yes, arrogant. The rest of the world probably doesn’t care a whole lot about what you do if it isn’t impacting their own freedoms and comforts. One of my favorite quotes from a different source: “Breaking news from Galileo! The world does not actually revolve around you!” People have their own stuff. They are worried about their own lives, their own loves, their own interests. Aside from the occasional busy-body that feels compelled to be in everyone else’s stuff (usually to avoid dealing with their own, shocker! ), people don’t actually let their thoughts and concerns drift outside the sphere of their own personal daily concerns. So far, so good. However, here is where we come to the sticking point. There is a difference between being genuine and confident and “not giving a F@$%”. I can hope that the majority of people who read the articles referenced will glean the pertinent and positive from them. Unfortunately, I fear that there are an equal number of people that will read these pieces as license to stomp all over the thoughts, feelings, and comforts of others that brush their lives in the bustle of daily interaction. One thing I do care about is respect, for myself and for others, and I strongly suspect that there are a number of people who have or will read these articles as “I don’t have to have respect for anyone else’s feelings or thoughts or opinions. I can be a bigoted, opinionated, hateful asshat and that’s cool because I’ve stopped giving a F@$% about what other people think.” I don’t necessarily believe that was the intent of the author, but intent can so frequently be misconstrued and misused by those who are probably going to be bigoted, opinionated, hateful asshats with or without permissive support of electronic or print media. My parting words: Read the articles. The disapprobation of others should never prevent you from making healthy and happy choices for your life. There are some really good points, but try to remember that while “not giving a F@$%” gives you freedom, truly not caring is not freedom, it is sociopathic. So, live a life embracing joy and enjoying activities that promote your wellbeing and self-esteem without worrying about the approbation of strangers. You will be healthier and happier in the long run. But please consider the feelings of people who care about you and whether you are willing to cause them pain. You might still give a F@$% about them, and hopefully, if they care about you, they will support you in your genuineness and positive self-esteem.